Are you looking for a place to take your kids on a hot summer’s day? Then come enjoy Wicker Memorial Park’s one of a kind Splash Pad. This 8,500 square foot water playground will entertain your children for hours upon hours. With over 30 spray features, the Splash Pad has become one of the region’s most popular water attractions. The Splash Pad is open seven days a week during the summer months. Wicker Memorial Park features an array of amenities for the community to enjoy. With an 18 hole golf course, 3 miles of trails, volleyball and tennis courts, a dog run, playground, picnic areas, banquet facilities and a recently added, one of a kind Splash Pad, Wicker Memorial Park has something to offer for all ages! Wicker Memorial Park also features a first class playground for children and parents which provides safety without sacrificing fun. 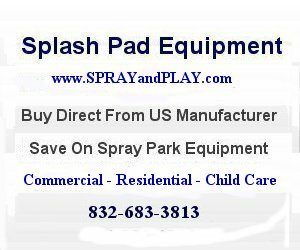 This entry was posted in Indiana and tagged Highland IN, Indiana, splash pad, sprayandplay, waterplay. Bookmark the permalink. I am interested on taking my children from day care center to a field trip tp the splash pod, it would be about 80 kids..
For more information about the Splash Pad, please give their office a call at 219-838-3420.